I’m not sure that funnest is actually a word. I googled it after saying it over and over in my head a hundred times and still couldn’t get a clear answer as to whether or not it is a word. I finally just went with my redneck instincts and left it in the title. Keep in mind, I used to teach middle school Language Arts. So I know I didn’t tell you I was doing an entryway makeover. I hadn’t really planned on doing an entryway makeover. And then it all just kind of happened. I didn’t hate the entryway before. I loved that navy wall, but that navy wall was really making the space dark. Furthermore, the circus would barely miss hitting her head on the corner of that table as she tornadoed down the hall. Really, I could just say that I did this whole makeover for her safety. Right? Quit shaking your head at me. I went into Kirkland’s a few weeks ago and lo and behold they were on sale for $13 a piece. And did you see how big they are? And then I got home and realized that I had grossly misjudged how much all four of them together on the wall would overpower the bench (I’ll get to the new bench in a minute). I was forced to pick favorites. The elephant and leopard won. Actually, my pick was the leopard and giraffe, but the circus screamed when I attempted to take the elephant off the wall, so that decided that. Sidenote: they are all still only $13 as of the writing of this post. And then there was the bench. You see, while I was in Kirkland’s I also happened upon this bench. And I’d been thinking I wanted a bench to put in place of the table. And this bench was a nice neutral, which meant it would work with my ever-changing decor. And it had nailhead trim. And nailhead trim kind of makes me all warm and fuzzy inside. So it came home with me too. Self deems it the “confetti wall” and you can read how Self and I did it here. And after the wall was finished, the bench placed in front of it, the art above it, I shopped my own house for the pillows, fur throw, and painted plant basket. Because I’m good like that. But then I realized the old light fixture no longer worked there. 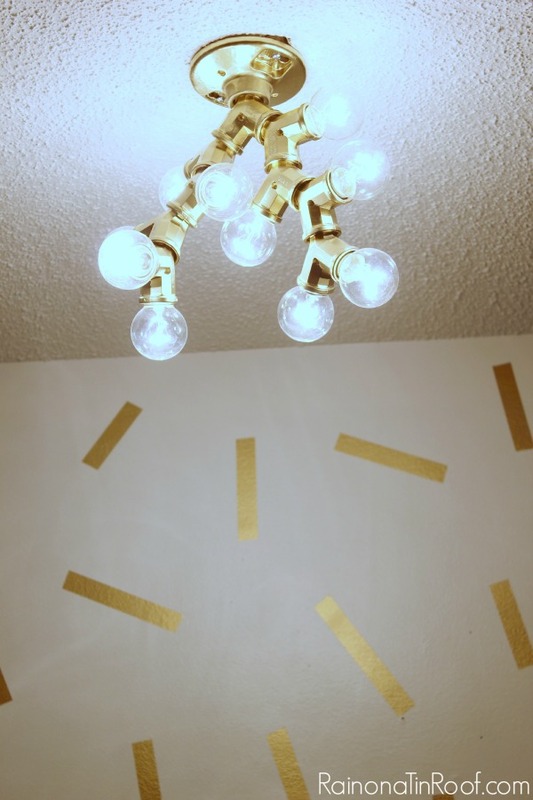 So I made a new super easy DIY light fixture for only $25. 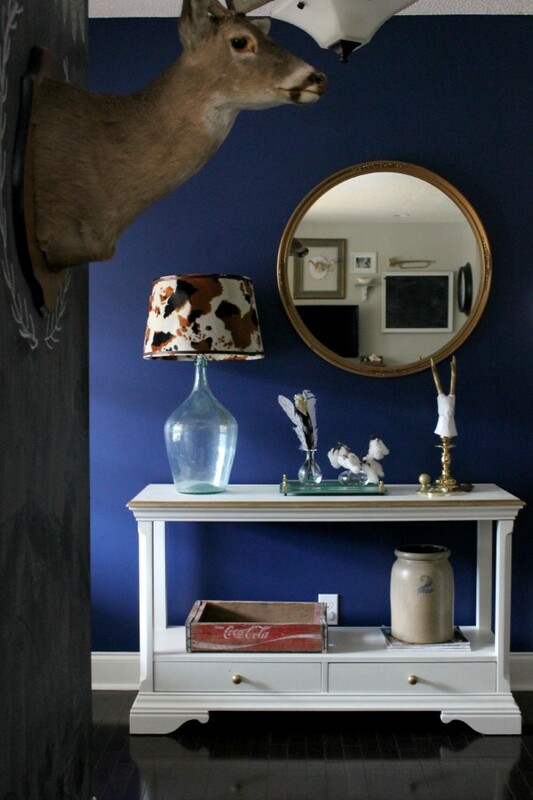 And that is how this entryway makeover came to be. Want to start on your own little fun and sporadic makeover? Kirkland’s is giving one lucky reader a $50 gift card to their store! Use the Rafflecopter below to enter. Open to residents ages 18 and older of the United States only. Disclosure: This post was a collaboration with Kirkland’s. All opinions and sporadic makeovers are 100% mine. Your foyer is beautiful! Dying over that wall and light fixture and all of it! Great job! Thank you, Angie!! I am over the moon with it – like a little schoolgirl! haha! I would get the milk bottle measuring cups, vintage rooster utensil holder, silver cupcake measuring spoon set and other kitchen stuff. Thanks, April! I nearly wet my pants when I saw those prints! If I won, I would get a mirror for the end of our hallway. There is a very small and plain mirror there right now. It actually came with the house, so it is time for an upgrade. I might do that whole wall in the Mirrored Circles Plaque. So fun! 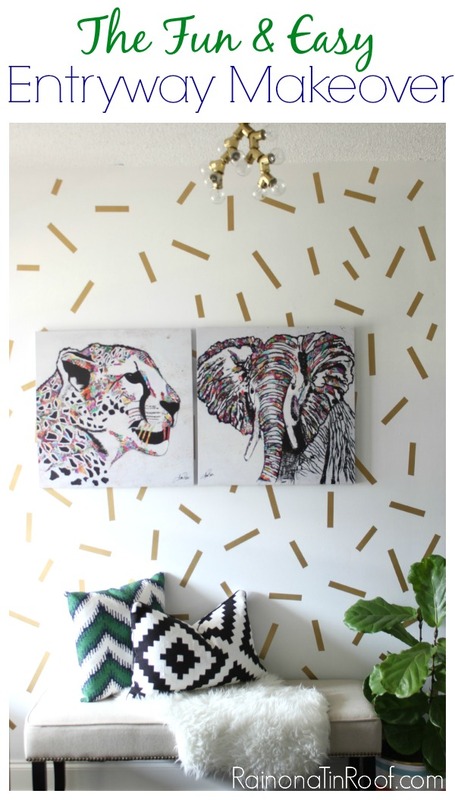 I love what you did with your entryway! I love this! As for the Kirkland’s purchase…I love the rustic driftwood sunburst mirror! Thanks, Nicolle! I LOVE that driftwood mirror too – I want it myself! If I won I would definitely get some new table lamps for the master bedroom. The ones we currently have are WAY too small! What a dramatic before and after! I’m sure it lightened your space tremendously. Love it all, Jenna! I really like the jackson blue lattice rug. Item #: 134111, love the color and it would look great with my new den furniture. i would spend the money on buying a table lamp! my vanity table is in desperate need for some lights! Mirror would be my first choice. Oh my. This is crazy good! I love it so much more. It is funnest and nuts like you!! Great Kirkland work! Go girl! hahaha!! Funnest and nuts – I love it! Thanks, Linda! LOVE the whole re-do! It is so colorful but not overwhelming. Great job! Kirklands has been one of my funnest stores for a long time. Lamps, and linens and pillows…oh my! I would definitely get the bronze hourglass & the chalkboard easel! Funnest, indeed, Chris! I’m glad you are embracing the questionable word as well! haha 🙂 Nope, you didn’t miss the light post – its coming! Love the re-do! Can you share your source for the black and white pillow on the lovely new bench? Thanks, Shelley! I’ve had that black and white pillow for a few years now – it came from IKEA. 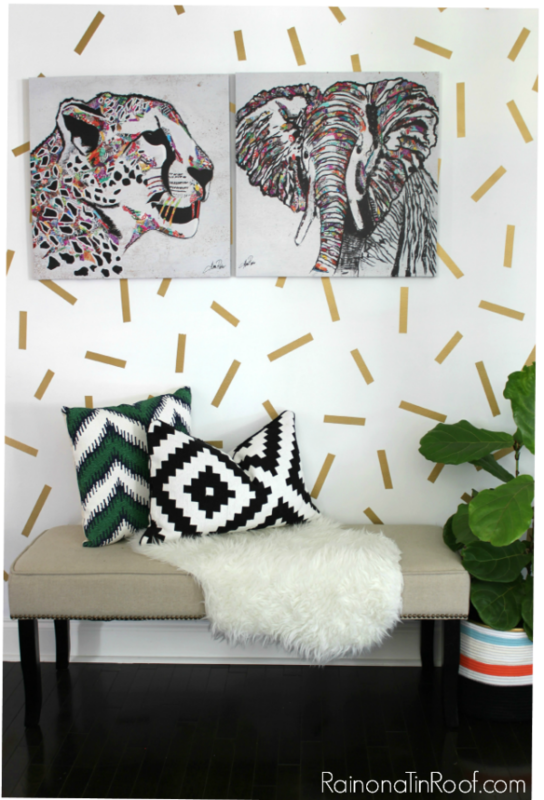 Love the foyer and love the prints! I might get the Olivia Aqua Tuffed Slipper Chair if I won. Great impulse redo. Love the pictures with all the confetti, and how could you be expected to pass up a price like that! I too have a thing for nail head trim and if it’s tuffed too, OMG. Not sure we have a Kirklands in Las Vegas, but if not I could use a good road trip to the nearest one for prices like what you got. Love your work. Girl, if that bench would have been tufted too, along with the nailheads, I may have passed out on the spot. haha! Double checked and we do have Kirlands here!!! How did I miss this store being added here in Las Vegas. I feel a shopping trip coming on. Love the black and white pic “Winter is coming” with the trees and sunlight streaming down. YAY, Cheryl!! You will love that store! Love the new entryway! I also love to shop Kirkland’s and love all their nautical decor so that’s what I would buy if I won the gift card. Hoping I do ! Thank you, Sheila! I love their nautical decor too – I was eyeing it pretty hard on my last visit, but alas, it doesn’t really fit in anywhere here. Love the Stinky Butler Toilet Paper Holder. So cute. I would buy the Bronze Metal Round Mirror, 30 in. WOW! So much to choose from! I would get(for starters) the turquoise Monogram Doormat! And some hanging candle doo dads!.Exciting! So many great things at Kirkland’s, but my favorite is their wall decor, and their globes! Oh…so difficult to choose from all the wonderful things that Kirkland’s has to offer…I guess I would choose one of the shelves with hooks for the entry way or…the beautiful lamp with a mercury glass base. Thanks so much Jenna and Kirkland for the generous giveaway! BTW, your new entry way makeover is outstanding! Thank you, Diane! And that mercury glass lamp base – I’ve seen it and love it! Oh how I need a floor lamp to go next to my study chair where I do my “teacher” work. Thanks for the giveaway. 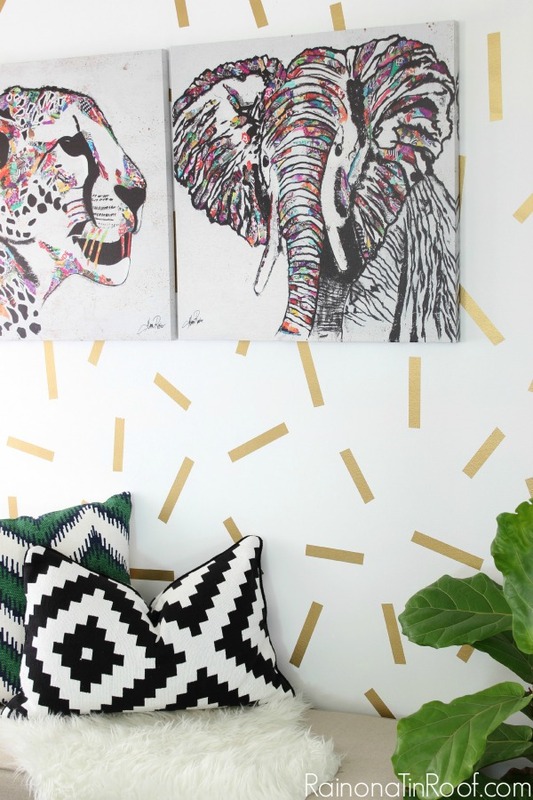 NEED that zebra print… OMG love it! i would put it towards a kitchen cart/island. thanks! ps-loving this lighter and brighter space. Love the entry, would kill for those animal prints but they are not available on line and I have never heard of Kirkland’s before, certainly not a store anywhere near me in Northern California. It doesn’t look like the giraffe and elephant are available online- bummer! The other two are though, Carol if that helps! I would buy one of those gorgeous mirrors! Gee, thanks for introducing me to such an addicting new store!!! Looking at some tables, your pictures, chairs…hmmm, can I just re-do my whole house??? Of course, there is a Kirkland’s about 10 miles from where I am right now…and Saturday I am childless, so I’m thinking I’m taking a little shopping trip! Enjoy, Susan! I can’t believe you didn’t know about Kirkland’s!! Its been around forever. I even remember being dragged through as a kid when I didn’t care anything about all that! haha! I really love everything. I wish I had an entry way with a bench. Especially living in New England (and on a farm) you really need a place to sit down and take your boots off when you come in. You did a lovely job. Thank you so much, Josephine! I totally know what you mean – neither of our last houses had really good entryways. I would love to have a bigger one now, but I’m thrilled with this one! I like the Paw Print Collapsible Pet Hut. I would buy a 4 quart red stoneware baking dish. The new artwork and paint are great. Bench and throw, cute! I’d get the Black Horse Table Lamp for my son. I would like the Ariel Wood Mirror. I would like to get the Acacia Wood Round Paddle Shelf, 20 in. I might choose the Gray Floral Canvas Art Print. Thank you for the chance. FUN!! Went to Kirklands when you insta’ed (is that a word?!) but it did not have them..maybe another one in my travels! Love both your writing style as well as your decorating style. They are both so great, i wish i had 1/10 of that style. Thanks, Cher! I didn’t really do anything – just put them together! Love the bench and I love Kirkland’s too! I’d love to get the Distressed Cherry Mirrored Cabinet for my entryway. If I’d win, I’d love to get the Poconos Wooden Wall Mirror. It’s GORGEOUS! I love these prints, well except for the Zebra honestly he looks like he had a lobotomy – where is the rest of his head and ears? OK now I feel bad cause I am afraid no one will buy him since he is missing half his head. I am going to have to think about something else otherwise I will end up buying him just because I feel bad. Argh assigning feelings to inanimate objects and loving the underdog is why i have a garage full of stuff! I mean treasures, a garage full of treasures. hahahaha!!! Oh my word, you crack me up!!!! Too funny! I’ll like to get Black Beadboard Storage Bench. I will be real tempted to put my gift card toward Bronze Teardrop 7-Pillar Candle Holder. That giraffe makes me smile! But I really need the bench at the foot of my bed! OMG! I think your makeover is awesome! So brave and bold! I love ! I love Kirklands as well!!! I would buy the Embossed Tan Gatehill Sherpa Blanket and 3 matching pillows all different sizes!! I just remodeled my master and they would be a great accent to the new bed! I didn’t think there was a Kirkland’s here, since we live in the middle of nowhere! But I found out there are TWO of them, just not in my little 3 mile radius I usually go to…they have some great items online & I bet the stores here have some too. Many things online I like, and we really could use a couple of new lamps, our bedroom lamps are path.et.ic. (is that a word?!?) I’m going to go take a look in the store closest to me. Love the entry changes & love the confetti wall you did! My first visit to your blog, and I love what you do with your home! Your entry just tells anyone who is coming into your home that they are entering a fun and friendly place. Awww, thanks so much, Pam! That is awesome to hear, because that is exactly what I want them to think! I like the Black Skinny Wood & Metal Candle Holders, Set of 3. Thanks. From Kirkland’s, I would get the Amber Single-arm Torchiere Reading Floor Lamp. I really love the wall treatment and bench. I wish we had a Kirkland’s closer to my house! Thank you, Amy! I wish you did too – they are great! I’m an idiot obviously – didn’t press POST COMMENT & got interrupted! Came back and tried to do it and — well, it won’t work. Guess I have to retype what I said so, here goes. Sorry to repeat! I didn’t think there was a Kirkland’s here since we live in the middle of nowhere! But I found out there are TWO of them, just not in my little 3 mile radius I usually go in. They have some great items online & I bet the stores here have some great items too. Many things online I like, and we really could use a couple of new lamps, our bedroom lamps are path.et.ic. (is that a word?!?) I’m going to go take a look in the store closest to me. Love the entry changes & love the confetti wall you did! I would get a painting to go over my bed, but not sure which one just yet, (they’re all so pretty! ), but because we are re-painting and haven’t decided on a color! I would get the Tonic Black 6-piece Curtain Panel Set, 84 in. love the fur throw on your entry bench! I would buy the Mirrored Quatrefoil Metal Plaques- or some sort of wall decor!!!! Kirklands has so many great things! I would get the Embossed Chocolate Gatehill Sherpa Blankets. I think I would get the Aqua Bathtub I Canvas Art Print. I like the Antiqued Silver Framed Mirror. That would look beautiful in my place. Love that Olivia Gray Tuffeted ottoman. $50 would help me buy that for under a hundred! I would buy lots of their room perfumes! I would use it to buy the Mirrored Geometric Wooden Plaque. I would get the Cowboy Boots Framed Art Print either for my office or the guest room. Thanks. I would buy the Brown Elephant table lamp. I think I’d put it toward a new media center — mine is so old it was made for those giant CRT televisons! I would buy the Savannah White Wicker Side Table. Wow! What a transformation! Love the confetti wall. Brain on overload with project possibilities. Thank you, Vicki! That wall was so easy to do! My children- or my dogs- someone isn’t talking- broke my lamp! I now need a set of lamps ,and Kirklands has some beautiful ones! I would probably buy two lamps! I just love the Black Butterfly Metal Patio Chair. It would be perfect on my patio. Oh I really love the Family Tree Leaves Collage Frame! That is so pretty! Nothing really caught my eye, but my mother loves KIRKLAND’S. If I were lucky enough to receive this, I’d re-gift it to her. I’d get the Brushed Metal Flowers Candle Centerpiece. I would get some of the ocean and beach scented potpourri! 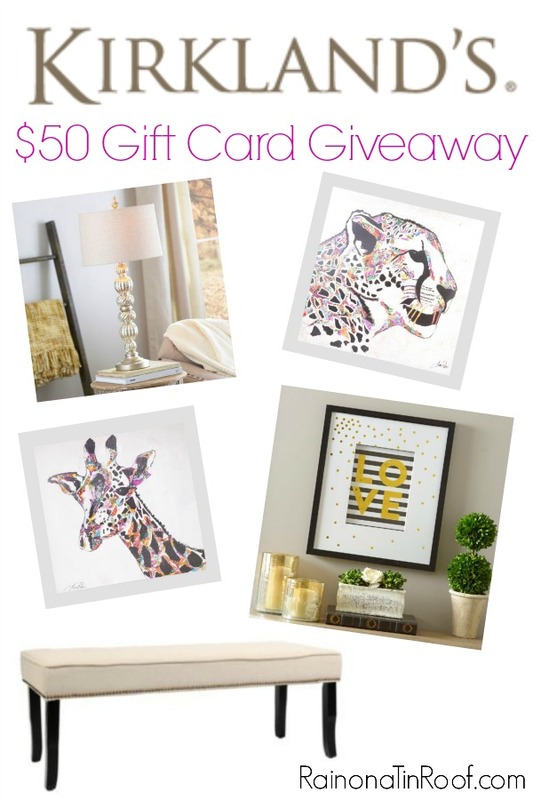 If I were to win, I would use the gift card towards the purchase of the Cheetah Print Chaise Lounger. Keeping my fingers crossed that I win. I really like the mercury glass table lamp. Jen I absolutely love your entryway! You come up with the funnest, most unique ideas. I love them all. Keep them coming! I so enjoy reading your posts. They are uplifting & so much fun. God bless you all & have a wonderful day! Thank you, Glenda! You just made my day with a such a sweet comment! Oops I almost forgot he he ! My sewing room needs some serious light so I would buy the Double Arm Reading Lamp on sale for $47.99. Good luck all & God bless. I would put it towards the Hudson turquoise chevron storage bench. I would want to get some new Easter decorations. I need new drapes, so I’d get that – maybe the Empire Gray 6-piece Curtain Panel Set, 84 in. I would maybe get the Coir Welcome Doormat. thank you!! Love this bench! Saw it at Kirkland’s the other day and just couldn’t figure out where I could put it in my house! Me too, Meg! I love it! I would definitely get some coffee mugs. I’m looking for wall art for my bedroom and bathroom. There is a lot of items I would buy this store is just my style …I love it..I might have to get another job to get everything I like. I love the turquoise metal mirrored tray. I love Kirklands! I need new lighting and love their lamps. Jenna, I love the Entry..bright, happy, playful and it makes Me smile, to pick what I would send the dough on…So tough! 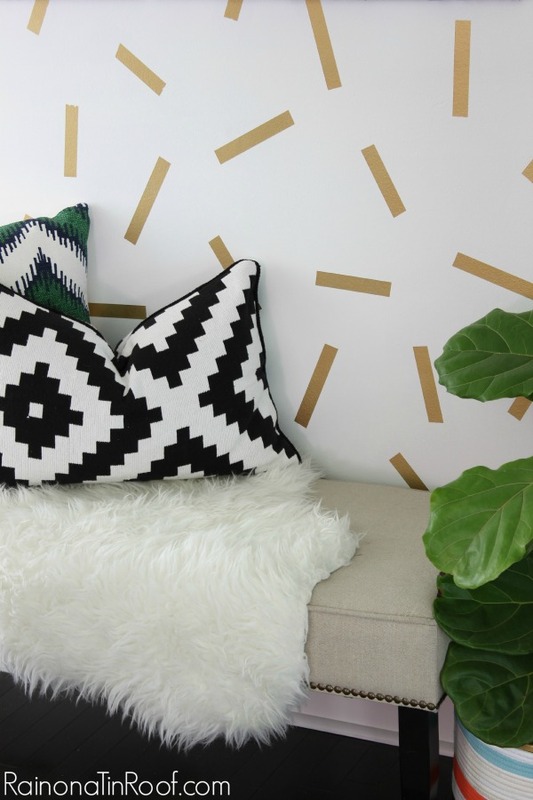 I just spent almost an hour drooling over rugs,lamps,a chair..I can’t pick just one…wait wait..forgot ..Love the gold too.is it tape..what a good idea. I would put it towards some various decor for my living room. I’d get the Double Chalkboard Plaque with Baskets! I love Kirklands! I would buy the Brushed Steel Orbs Floor Lamp. I’d love to get the Bronze Knight Floor Lamp! I’d put it toward the Brandy 5-Drawer Chest. There are so many great items at Kirklands – its hard to choose just one favorite. One favorite that stands out a little more than others is the Black Marrakech 8-pc. King Comforter Set. I would get the Marrakech Spice curtain panels and redo my spare room based on those colors! I like the kids pink elephant buffet lamp and the princess storage block in pink. I would love to get a few of the Clear Hobnail Glass Lanterns! Love the Antiqued Silver framed mirror- would make such an elegant addition to any home! If I won I would buy this Mahogany Cheval Floor Mirror that Ive been wanting for my bedroom! I Like the Cream Hydrangea Stack! I would buy a table lamp. I would like to buy the Turquoise Oversized Throw Blanket. I would get new couch pillows. I love the entry! I’m also loving the Kirkland giveaway! I just moved and need barstools and a new entry design…confetti and IndustrialBar Stools here I come! I think I would use it towards a storage bench for the living room. Wooden Crate Storage Ottoman is so neat and would be great to put my granddaughters toys in. There’s so much I like, the Jackson Paisley rug, Distressed Red Open-Face Clock, and Sunburst Mirror to name a few. I would buy the Navy Blue Anchor Wall Plaque. I love nautical themes! I’d buy the Resin Peacock Statue. Black Hall Tree with Storage Bench is something I’d love to have in my entryway. Thanks for the giveaway! Black Hall Tree with Storage Bench is something I’d love to have in my entryway. Thanks for the giveaway! I hope this isn’t a repeat post. The site sort of bogged down after I posted the first time. I would get the Nested Baskets with Chalkboard Labels, Set of 3! If I win this fantastic contest I would buy pillows for our outdoor swing! I’d buy the wooden crate storage ottoman. The Antique Scroll Silver Clock would look lovely over my mantle. I would love to buy that. I like the Parker Scroll Sconce, Set of 2, very pretty and would definitely help with the living room re-do I am planning in the Spring. I spent some time on the site and would seriously consider purchasing the Burlap Dahlia and Peony Centerpiece. But I would want to look at everything before making a final choice. Looks like there are a lot of wonderful contenders for a purchase (and also for the gift card). Good luck to all! I would get the Aqua Ceramic Lighthouse Candle Holder! I would get the Rustic Driftwood Sunburst Mirror, 43 in. I would get the Scrolled Cherry Magazine Table. I visited the page but I’d save it for Christmas because I love buying their decorations.